This Situation Update describes issues and events occurring in Thandaunggyi Township, Toungoo District during the period between June and August 2016, including education, healthcare, livelihood, development, Tatmadaw military activities and Karen National Union activities. On July 25th 2016, commander-in-chief of Myanmar armed forces, Senior General Min Aung Hlaing made a trip to Bu Yin Naung camp Town in Thandaunggyi Township, Toungoo District. There, he called some leaders to discuss about military activities. The road was full of soldiers in Thandaunggyi Township for his security. After his trip, Tatmadaw army troops rotated their troops in the army camps in the east of Thandaunggyi Township. On August 11th 2016, Tatmadaw soldiers from Bu Yin Naung camp Town, Thandaunggyi Township set up signposts on villagers’ land in A--- village, B--- village and C--- village in Thandaunggyi Township. According to the signpost, those lands are now the property of Tatmadaw and are to be used as a Tatmadaw target practice area so none of the local villagers should trespass on those lands. The villagers who lost their lands now face many concerns and many problems. Villagers in Thandaung Myo Thit Town reported that they have to pay many fees with regard to education. These fees include school materials, teachers’ travel costs, hiring teachers and paying for student certificates. For example, each student has to pay 1,000 kyat (US $0.74) to one teacher per month to be employed. It causes a problem for some students’ parents regarding their livelihood because they do not have a good enough income to pay for their children to study. Villagers reported additional challenges with education which included one teacher who was abusive to a male student from A-- Standard at the high school in Thandaung Town. Regarding this case, the students commented that, “This teacher, U B---, is totally different from other teachers. The way he teaches [treats] the students is not suitable with the purpose [job role] of Burma/Myanmar government staff [teachers]”. Lands belonging to villagers in Sa Pin Gyi village tract in Thandaunggyi Township, Toungoo District were confiscated by local Burma/Myanmar government forestry department and those lands were made into Si Phyu Daw protected area. The villagers tried to report the case to the forest administrator from the Burma/Myanmar government forestry department in order to have their lands returned. However, the forest administrator has not returned those confiscated lands to local villagers until now. Therefore, the villagers who are seeking to reclaim their lands are facing livelihood issues. The following Situation Update was received by KHRG in August 2016. It was written by a community member in Toungoo District who has been trained by KHRG to monitor human rights conditions. It is presented below translated exactly as originally written, save for minor edits for clarity and security. This report was received along with other information from Toungoo District, including one incident report, eight interviews and 192 photographs. I [KHRG community member] have collected the information about human rights abuses [events] happening in Thandaunggyi Township, Toungoo District during the period between June 2016 and August 2016, including education, healthcare, livelihoods, development projects and military activities. While the previous [before the preliminary ceasefire agreement] Burma/Myanmar government military [Tatmadaw] was operating [controlling] in the east of Thout Yay Ket village, Thandaunggyi Township, about 30 villages were ruined [because of forced relocation]. Now the villagers are trying to rebuild their villages to live. The villagers wanted to send their children to school. Therefore, they have tried to construct self-funded schools. Among 18 villages, the villagers have been able to build three schools for the local children. The villagers also had to hire teachers to teach children at the school. One teacher received 300,000 Kyat [per year] [US $222.41] funded by the villagers. Karen Education Department [KED] also supported the teachers with 200,000 Kyat [US $148.27]. Although KED contributed text books and some class materials and support materials to the school, the students did not have enough note books and pencils. These villages are migrant villages [villages which were forcibly relocated] which are now controlled by Karen National Union [KNU]. There is a middle school at the Township level which was established by KNU government in their controlled area but there are some difficulties for children to attend this middle school. The [local] education department of Burma/Myanmar government has never donated any books or pencils to the schools in KNU controlled area. Many children in those migrant villages could not go to the school. Some children are getting old enough to go to school but they are unable to attend the school because of many different reasons. In some villages, there is still no primary school. The local villagers in these villages wanted to build self-funded primary schools for children but they could not afford to hire school teachers to teach their children. Therefore, they have not constructed those schools. Some parents in the village sent their children to the Burma/Myanmar government’s primary school in Section (1), Thandaunggyi Town. [During the reporting period] Naw A---, the headmistress, called students’ parents to attend a meeting. Then, she requested the parents to donate one or two zinc sheets for each student in order to rebuild the roof of the school. In addition to this, if the school teachers have to travel or move [to another school], the headmistress tries to collect 500 or 1,000 kyat [$0.32 or $0.74] from each student to support those school teachers. Additionally, the local villagers in some villages could not send their children to the school because they do not have any schools in their villages. Some parents want their children to stay at their relatives’ houses [in other villages/towns] in order to attend a school. There is also the situation that some parents had to make their children leave the school because of their livelihood challenges. The students do not need to pay school fees at the Burma/Myanmar government schools. At middle school or high school, the students have to pay for text books. The parents have to buy note books for their children. For the primary school, the students could have text books and note books for free but they do not receive adequate note books; their parents have to buy [additional] note books for them if necessary. Moreover, the school contributes one school uniform set per student per year at the primary school. The school teachers often called students’ parents for a school meeting and they told the parents about what the school needs. Then, they asked and collected money from the parents for a school fund. The teachers also collected money from the parents in order to get funds when they celebrated their prize-giving ceremony at the school. Each parent had to pay 5,000 kyat [US $3.70] to the primary school (#2) in Thandaung Myo Thit Town in order to provide food for everyone who attend the prize-giving ceremony. The school in the village also often collects money from the parents in the same way in order to get a school fund. If the teacher has to move from the village to another place, the school teachers collect 500 kyat or 1,000 kyat [$0.32 to $0.72] from each student to support that teacher. Some teachers are not willing to go and teach the children at the school which is situated in the remote area because it is too far for them to travel to the school. It causes a problem for the students [as they do not have enough teachers]. Some [Burma/Myanmar government] teachers submitted a letter to their education administrator in order [to gain permission] to leave the school in the [remote] village. That is why the school in the village does not have enough teachers. Two female high school teachers from the high school in Thandaung Myo Thit Town, Thandaunggyi Township, Toungoo District, have also moved on to another place. Therefore, the headmaster in that high school in Thandaung Myo Thit Town called students’ parents for a meeting and he told the parents that they have to hire two other high school teachers. He also said that each student has to pay 1,000 kyat [$0.72] to hire the new teachers. There are more than 150 students who are studying in Standard 10 at the high school in Thanduang Myo Thit Town. However, the students had to employ their own teachers to teach them. Each student had to pay 1,000 kyat [$0.74] for one teacher [per month]. For two teachers, they had to pay 2,000 kyat [$1.48] per month. [These additional fees] caused a problem to some students’ parents. There are some schools in the Burma/Myanmar government’s controlled area but the Burma/Myanmar government did not hire enough teachers for the school. It became difficult for students to study in the school. The Burma/Myanmar government said that they have given an opportunity to learn Karen language at the schools in Karen State. In reality, they have not prioritised Karen literature in the school. The teachers just have to teach Karen language in their free time but not during school time. The [Karen language] school teachers do not get salaries so therefore there will be no teacher who teaches Karen language during this [school] time. Some teachers in some villages try to teach the children Karen language one hour per day although they do not get any salary. They teach [for free] because they want the children in the village to be able read and write Karen language. It is expected that the children at nursery school [from Standard 1 to Standard 4] should learn Karen language. The primary school must be opened officially [by the Burma/Myanmar government] in the village but the school teachers do not receive their salaries officially [by the Burma/Myanmar government because villagers must pay them]. Therefore, the local villagers have to hire school teachers. In some villages, the villagers could hire school teachers but they could not build the school. So they have to build the school according to the village head’s plan. [Hiring the teachers] causes problem to the villagers regarding their [economic] livelihoods. Regarding the situation of education and the building of the school in Thay Ywar You village which is located in the east of Thauk Yay Hkat Chaung village, Thandaunggyi Township, Toungoo District, the Burma/Myanmar government controlled-area, the school teachers are not allowed to teach students for private tuition but some teachers do teach students for private tuition and they ask 35,000 Kyat [US $25.95] per month from each student for the [private] tuition fee. Some teachers ask 7,000 Kyat [US $5.19] for only one subject from one student [per month]. Due to this private tuition, the school teachers seem to care about the students who are learning in their private tuition but they just ignore the rest of the students [during school time]. There is a teacher, U B---, who teaches students at the high school in Thanduang Town. U B--- also teacesh students who want to learn in his private tuition classes. He asks 300,000 Kyat [US $222.41] per year from students who study in 8th Standard, 400,000 Kyat [US $296.55] per year from students who study in 9th Standard, and 600,000 Kyat [US $444.83] per year from students who study in 10th Standard. There are many students who could not learn in those private tuition classes because they could not pay the tuition fees. The teaching in the school is not very effective and it is beneficial to learn in the private tuition classes because teachers teach well in private tuition. The subject U B--- is teaching in the school is Mathematics which is very difficult for students. Thus, students [who study in his private tuition] understand very well but the rest of the students [who do not study in his private tuition] do not understand Mathematics subject very well. Moreover, U B--- cruelly scolds the students when he is teaching in the class. In one incident, on August 11th 2016, U B--- challenged a male student from A--- Standard as his enemy. Regarding this case, the students commented that, “This teacher is totally different from other teachers. The way he teaches [treats] the students is not suitable with the purpose [job role] of Burma/Myanmar government staff [teachers]”. The Burma/Myanmar government said that they are trying to support students who are poor. So they collected a list of the students [who are poor]. Although a small number of really poor students have been on the list, most of the students on the list are the children of Burma/Myanmar government staff. In reality, some parents who could not buy any shoes for their children are not on the list. Also, when the students go to the school in the town, they have to cross the street in the town. So they face some danger because there are many cars and motorbikes in the street. That is why they need to have a traffic policeman to take care of those children. Motorbike accidents often happened in Pyar Sa Khen village, Thandaunggyi Township, Toungoo District. In some cases, students have died because of these motorbike accidents. Therefore, it is dangerous for students when they go to their school. Regarding the healthcare situation within Thandaunggyi Township, Toungoo District, the villagers in the rural area which is controlled by the Burma/Myanmar government do not receive full and adequate medical treatment. Women and their children have to get vaccinations every month. However, the Burma/Myanmar government’s health workers just come to the rural area to give vaccination in the summer. They do not come to give any medical treatment in the rainy season because they complain that they cannot go there because of the rain and transportation problems. If the villagers get sick, they just go to buy medicine from the outside [pharmacy shops] as usual. When they give vaccinations to the villagers, the Burma/Myanmar government’s health workers do not give a lot of time to the villagers so that some villagers cannot get vaccinated. Also, if the villagers go to the hospital when they are sick, they do not get medical treatment for free. Moreover, there is no adequate medicine in the hospital so the villagers have to buy medicine from outside [at a pharmacy shop]. Mostly, the villagers are suffering from illnesses such as dengue haemorrhagic fever and general illness when the seasons change. When the patients go to some hospitals for medical treatment, some doctors do not get along with each other. They [doctors] argue with each other because they want to give medical treatment to different patients whom they favour. That is why the patients [villagers] face difficulties. There are two doctors in the Thandaung Myo Thit hospital. One of them has his own clinic so the patients have to pay money if they go to that clinic for medical treatment. The other one [doctor] is trying to help the patients for free. Therefore, they do not get along with each other because of the way they treat the patients. They only want to give medical treatment to the patients whom they favour. Some pregnant women’s babies have died when they were delivered. Actually, their babies should not die. A doctor who has goodwill is willing to help the patients who want to go to him. A doctor who has a private clinic only wants to give medical treatment to the patients who he accepts and he does not treat all the patients equally who want medical treatment [because some cannot pay him so they do not receive treatment]. Thus, many patients have lost their opportunities to get medical treatment. That is why some patients go to other clinics but it costs a lot of money for medical treatment. There is a [Tatmadaw] military hospital in Bu Yin Naung camp Town in Thandaunggyi Township. This military hospital has full medical supplies. Only the people who are related to and familiar with Tatmadaw soldiers go to this military hospital for medical treatment. Most of the villagers do not go to the military hospital for medical treatment because they are still afraid of Tatmadaw soldiers, as usual. The ordinary [government] hospital does not have enough medicine so the people [patients] have to go to buy medicine at the pharmacy [outside]. Some people also buy medicine from some Burma/Myanmar government health staff. There are four towns in Thandaunggyi Township. Each town has a hospital but the hospitals do not have enough medicine. There are many local clinics in the rural areas but those clinics also do not have enough medicine. Therefore, the Burma/Myanmar local government health workers at those clinics have to invest their money and they buy medicine from outside in order to give medical treatment to the patients [and sell the patients the medicine]. However, they ask for more money from the patients than the cost of the medicine. There are some health workers who are hired by the Burma/Myanmar government in some local clinics but they do not fulfil their duties. That is why more and more villagers chose to buy and use traditional medicine. Some villagers like to ask help from local medics [who do not have formal training] in order to [know which] medicine to buy that can cure their illnesses. Especially in the KNU [Karen National Union] and Burma/Myanmar government, mixed-control rural area, Burma/Myanmar government health workers do not go to give medical treatment and vaccinations to the villagers. Therefore, many mothers and babies in these villages do not get the necessary vaccinations although the babies are getting old enough to get vaccinated. In the KNU controlled-area, KNU [KNLA]’s medical unit provides medicine to the local villagers as much as they can. Also, Back Pack Health Workers [BPHWT] sometimes come to the village and they try to give medical treatment and vaccinations to the villagers. The villagers who live near to KNU [KNLA] army camp go to get medical treatment from the [KNLA] medial unit but the villagers who live far away from the KNU [KNLA] army camp do not come. KNU [KNLA]’s medical unit just gives limited medical treatment to the villagers depending on what kind of symptoms and diseases [they have] because it does not have enough medicine; they try to help the villagers as much as they can. There are military health workers in the KNU [KNLA]’s medical team in their army. The villagers who live near to KNU [KNLA] army camp often go to see military health workers when they are sick and these military health workers give medical treatment to the villagers for free. However, they [KNU/KNLA military health workers] do not have enough medicine so the villagers have to go and buy medicine that they need from outside [pharmacy]. Religious readers from KBC [Karen Baptist Convention] selected some people from the village who can read and write in order to give them medical training [once a month]. Then, they go back and help other villagers in their village. They [religious leaders from KBC] only chose one person from each village to give medical training to. After they attend the medical training, the chosen villagers could go back to their village to help people who get sick. However, they can only give oral medicine to the villagers [not injections]. In order to be able to give medicine to the villagers, KBC contributes the medicine to the chosen people who attend the medical training once every month. Then, the chosen people have to report to KBC after one month regarding the list of medicine [that they distributed]. However, the chosen people do not get any salary. They are just volunteers to provide healthcare services. In order to treat or cure people who have serious diseases and illnesses, they [KBC volunteers] just send the patients to KNU’s hospital for medical treatment if they cannot handle the case themselves. KBC only gives medical training to the chosen people for one month so therefore the chosen people face difficulties when they are giving medical treatment. The basic education they have learned and the diseases that their patients have experienced are different so there are [medical] situations that they cannot not provide medical treatment for. In their villages, they just use their small bamboo house as a clinic. However, the medicine they keep in their houses gets spoiled because of the rain; the roofs of their houses are not very good and also their houses are not very strong. If the people in their villages get a serious illness, they have to send the patients to the Burma/Myanmar government hospital. When they send the patients to the hospital, they have to face a problem of carrying the patients a long way to go to the hospital. Then, when the patients arrive at the hospital they have language problems because they cannot speak Burmese to communicate with the doctor and also they do not have enough money to pay for the medical fee. That is why they prefer to go to traditional [herbal] doctors for their medical treatment. Although the villagers face money issues with supporting their livelihoods and medical fees, they just go to see traditional medical doctors in the village for medical treatment when they are sick. Finally, some of the villagers died because they could not pay to go to hospital. The pregnant women in the village have to give their birth with the help of the local [not formally trained] midwife. They just take traditional medicines. They do not take modern English medicine. They use roots as medicine. The common diseases in the rural village are flu, malaria and general illness when the seasons change. The villagers in the rural area in Thandaunggyi Township, Toungoo District are working in their gardens and most of them are low-skilled workers but a few people are working as Burma/Myanmar government staff. The villagers mainly grow betel nut, cardamom, dog fruit and rubber trees. They also grow crops in their garden to support their livelihood. In 2016, the villagers could not produce durian fruits and mangosteen fruits because the weather was too hot. Also, they could not grow betel nut very well. Therefore, the villagers could not make a good income. Their cardamom plants collapsed because of very hot weather and storms. As a result, the fruit did not grow properly. They [villagers] have to sell one big tin (eight bowls) of dog fruits for only 3,500 kyat [US $2.59] because of these problems in the village. The price of the fruits is not good [when villagers sell them] but the price of commodities [when villagers buy them] has increased. Their fruit costs and food costs do not match. The daily wage [as a labourer] is from 3,500 kyat to 4,000 kyat [US $2.59 to $2.96] so they struggle to support themselves with their livelihood. The price of meat has also increased. Their incomes are not sufficient for their expenses. They also face some other difficulties regarding their education, healthcare and social activities. In some places in the jungle around Leik Tho Town, some villagers currently have to forage for bamboo shoots in order to support their livelihood. KNU forestry department also set up the rule that people cannot cut bamboo or trees in Thandaunggyi Township, Toungoo District in order to keep the forest ever-green. However, the villagers are stealing by cutting bamboo shoots. They sell it to support their livelihood. Some people who [already] have money try to work with the local Burma/Myanmar government in order to make [more] money as pawnbrokers or money lenders. Some villagers have to show and give their land grants or land tax vouchers to business people [pawnbrokers or money lenders] when they go to borrow money [as collateral for their loan]. The villagers have concerns that they will lose their lands one day [if they cannot repay the loan]. Despite their concerns, the villagers have to borrow money from pawnbrokers because of the different [financial] problems they have. When the villagers try to borrow money, they do not get the full amount of money that they want to borrow [because middle men take part of the money]. The money they borrow has been reduced because of [corruption within] the money-borrowing process. The Burma/Myanmar government started to build Pa Thit dam in 1996 in Thandaunggyi Township, Toungoo District. Due to this dam, many of their villagers’ lands in Ywar Gyi Khoe Kwin village, Nat Thar Khone village and Ngwe Toung Gyi village in Ywar Gyi village tract when they were covered with water. The villagers are now confronted with livelihood problems because they have lost their lands. Therefore, they have to catch fish in the water which now covers their land in order to earn their livelihood. Some people have to leave their village and they go to look for jobs such as tree-cutting and gold-digging as daily labourers. Sometimes their face the problem when they are doing their jobs that they do not get paid their daily wage. Moreover, their chainsaws are confiscated [if they are caught cutting trees]. Some of the villagers’ lands in Sa Pin Gyi village tract in Thandaunggyi Township, Toungoo District were confiscated by local Burma/Myanmar government forestry department and those lands were re-claimed as Si Phyu Daw forest protection area. The villagers tried to report the case to the forestry administrator from Burma/Myanmar government forestry department in order to get back their grandparents’ lands. However, in 2014, I [KHRG community member] often researched the case in that area. Until now, the forestry administrator has not returned those confiscated lands. Therefore, the villagers who lost their lands are facing livelihood issues. The villagers just depend on the fruits from their gardens in order to support their livelihoods. They send their children to the school with the money they earn from the garden. They also pay their medical fees if they are sick with the money they earn from the garden. However, they cannot solve all the problems they have in their family. They are just getting by [they just survive without extra food and money]. The villagers on the mountain also have to confront livelihood issues because the price of the fruits from their gardens is not very good. They cannot not produce good fruits because of the bad weather so they could not get a good price. The villagers who grow seasonal fruits are also not able to grow good seasonal fruits. The price is not good. Therefore, they have to take [borrow] rice, salt and fish paste from the traders as a debt [on credit] in order to support their livelihoods. Later on, they will have to give back money [to pay off the credit] to the traders when they have sold their cardamom, betel nut and coffee in another season. The traders demand more money unfairly [add interest to the loan] than the villagers have to pay back. Some villagers have to work as daily labourers to earn their livelihood. They also send their children to the school with the money they earn from their daily wages but they do not let their children go to study in the private tuition because they cannot pay the tuition fee. Some villagers who have shops cannot sell their products because the people buy their products on credit [promising to pay in the future]. Therefore, their incomes are not rotating well and they cannot make enough to invest in buying products to sell again so it is difficult for them to earn a regular income. The price of commodities is increasing year by year so the money that the breadwinners make and the expenses that they have are not equal. So this causes some family issues [arguments] between wives and their husbands. For the people who earn their livelihood from rubber plantations, they can sell one pound of rubber for 500 kyat [US $0.32] so it is not easy to support their families [because this price is low]. For the people who make raw rubber from the rubber trees as daily labourers, they cannot get a good daily wage. The rubber plantation owner also cannot hire them anymore so they became unemployed. Because of being unemployed, some people try to drink alcohol and it causes conflict within their families. They try to look for jobs but no one hires them to get a job. In the past, there were the people who are porters/carriers and they had to carry fruits such as dog fruits, cardamom and betel nuts so they got paid but now people only use vehicles such as motorbikes to carry this food. That is why it is not easy to get that kind of job anymore for the people who were porters/carriers. People who are from the construction department [from Burma/Myanmar government] call the villagers to be their labourers in order to construct roads. The villagers have to do it without choice even though they get only 3,500 Kyat [US $2.59] per day. It is not easy for them to support their livelihood with the money they get. The majority of the local residents in Thandaunggyi Township are daily labourers. Burma/Myanmar government forestry department tried to measure and set up more than 300,000 acres of lands in Thandaunggyi Township for Si Phyu Daw forest reserve. The land that they have designated for forest reserve is land that local villagers are farming and gardening on. The villagers therefore wonder what will happen to their lands in the future. In 2000, Major General Win Myint confiscated villagers’ lands in Section (1) and Section (2) in Thandaunggyi Township in order to keep those lands for [Tatmadaw] army. Those lands are the villagers’ gardens. However, the villagers have to pay the seasonal fruit tax to Ya Ka Tha [Warrant Officer and Sergeant Training School] group which is under Bu Yin Naung camp Town [Tatmadaw]. The villagers who live in Tan Mon village tract and Kyauk Phyar village tract, Leik Tho Town, Thandaunggyi Township are mostly working on hill farming but it is not enough [food/income] to support their livelihood because they could not grow plants on their hill farms very well as a result of poor plant fertility and bad weather. Because of livelihood needs, other villagers who live in Auak Kyin Auak Ywar village come to cut down wood although the local villagers try to protect the forest. That is why it becomes deforestation. Because of that [cutting down trees], the villagers come to have a conflict with each other. Many years ago, U Khin Maung Aye who is the chairperson of CB Bank [Co-Operative Bank LTD] from Kaung Myanmar Aung [Company] confiscated local villagers’ lands in Toh Boh village, Na Gar Mauk village and Yay Ao Sin village in Toungoo Township. Moreover, he has sued the villagers for trespassing on these confiscated lands. This case has not finished yet. The [accused] villagers are called to go to court once every two weeks. Therefore, the villagers have to confront livelihood issues because they cannot do their jobs very well [because they have to travel frequently to court]. 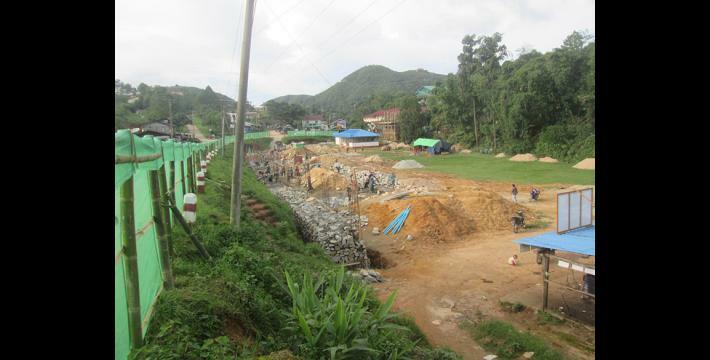 Regarding development in Thandaunggyi Township, Chan Mya Wai Si Company, Ngwe Win Phyo Company and an [unknown] construction company have arrived in Thandaunggyi Township and they have constructed roads and bridges. Also, Shwe Pyin Daw Company has constructed a telecommunication tower. There is also Wai Yan Kyaw Company. Chan Mya Wai Si Company constructed the road in Thandaunggyi Township without negotiating with the local villagers. The local villagers did not know that they were constructing the road but only the village head knew about that. 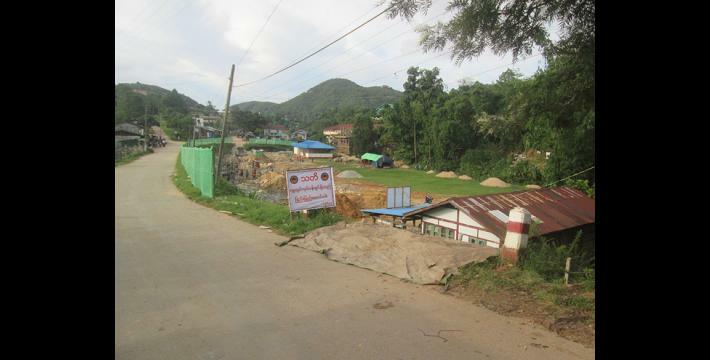 Chan Mya Wai Si Company just reported to the Burma/Myanmar government when the road was finished. However, Chan Mya Wai Si Company did not finish constructing the distance that the Burma/Myanmar government asked them to do. Besides, the villagers could travel only in hot season but they could not travel on that constructed road in rainy season because the dirt around the road collapsed due to rain. As a result, the road was destroyed. So it is difficult to travel by motorbike and car [in rainy season]. Also, the companies did not construct every bridge that they were asked to do but they signed in the agreement paper that all the bridges were successfully constructed. The distance of the road between Shwe Nyaung Pin village and Maung Nwe Gyi village is just 7 miles but they [company] only put the stone on that road for 6 miles. The rest of the road has not been finished but they [company] said all the road was finished. Because of heavy rain this year, the road was almost destroyed. The road between Thanduanggyi Township and Late Phyar Gyi Town was constructed in the hot season but it is difficult to use this road in the rainy season. They [company] did not do their best when they constructed the road in the rural area. They did not discuss or work together with the Burma/Myanmar government engineers and road constructors so they could not construct a road of good quality. In order to construct schools, they [company] just followed the plan which was made by former members of parliament from the Burma/Myanmar government. Regarding school construction which takes place in Thay Ywar You village, Meh K’doe village and other villages in Thandaunggyi Township, former members of parliament took responsibility for school construction so they only gave people [who are close with them] employment opportunities to manage the school construction project. However, the villagers did not know about school construction project. They [people who are responsible for school construction project] just discussed [the construction] with the village administrator [and not the rest of the community]. The football ground in Thandaunggyi Township was lost and destroyed due to road construction because it was used for the road, but they [road constructors] did not replace any land for the football ground. This football ground is owned by community. Therefore, students and local people are not able to play any sport on the football ground because it was destroyed. Community [infrastructure] development in local villages is needed in order to improve transportation. Thus, people who are responsible for development projects told local villagers about what they were going to do. Representatives of companies persuaded local villagers that they [villagers] would take the lead for community development. In fact, they [companies] did not discuss with every villager in [every] village about these community development projects but they just discussed with the village heads and elder people in these villages. They also did not tell everyone about the [positive/negative] impact of community development project. The Burma/Myanmar government collaborated with a [unnamed] Japanese Company to build a telecommunication tower in A’lel Chaung A’Tet Ywar village, Thandaunggyi Township, Toungoo District. Shwe Pyin Daw Company is responsible for constructing the telecommunication tower. However, they [Shwe Pyin Daw Company] did not inform local villagers [about the construction]. Besides, they did not discuss with local KNU authorities, they just negotiated with U Win Myint, the parliament representative for the Karen People’s Party. They constructed a telecommunication tower on local villagers’ land. Because of that, there was a disagreement between local villagers and Shwe Pyin Daw Company. “Our department is the Burma/Myanmar government’s department so the Burma/Myanmar government will not give money [compensation for lost land]. In the past, we had constructed other telecommunication towers on the villagers’ land without giving money [compensation]. For the current telecommunication tower that we constructed, we will report to the Burma/Myanmar government’s leaders to arrange money [compensation] for villagers. Our Burma/Myanmar Communication Department is funded by the Japanese Company”. “If you want to construct a telecommunication tower in the area under our [KNU] control, you have to first discuss with local villagers and you have to get a permission from them. Also, you have to abide by our KNU policies”. “We will report your demands to the Burma/Myanmar government’s leaders. We ourselves cannot not make a decision about that”. Local villagers do not know anything about the location where the telecommunication tower would be constructed. In 2016 and 2017, the Burma/Myanmar government will provide financial support to 50 local schools in remote areas in Thandaunggyi Township. Therefore, 35,000,000 kyat [US $25,948.30] will be shared [allocated] between the local schools. The schools must be constructed with concrete. It is difficult to go to those villages in remote areas because of the [bad] roads. They [villagers] do not have a vehicle road. Therefore, it is difficult for them to transport school materials for construction. It concerns the villagers that their local schools will be relocated [to a place that is easier to access]. Zaykabar Company constructed the road in Thandaung Myo Thit Town, Thandaunggyi Township, Toungoo District in order to go easily to the beautiful buildings [that are nearby] such as hotels. They [Zaykabar Company] discussed about constructing the road with the town administrator and other townspeople with responsibility. Due to their road construction, the bank of the local stream was destroyed and the dirt fell into the stream making the water in the stream dirty. This stream is called Pa’thi Chaung. Local villagers in that area use this stream water as drinking water. Therefore, it caused a problem for local villagers to get drinking water. Besides, there are beautiful buildings for visiting nearby the road construction. So a lot of people go there and they travel there by motorbikes and cars. That’s why they [Zaykabar Company] made a gate [checkpoint] and they collect road fees from the people. There are a lot of places to go for a picnic. Many young people bring alcohol and food when they go for a picnic but they throw their alcohol bottles and waste on the ground unwisely. Therefore, it creates a hazard for local villagers. The road was constructed roughly in Kywe Phyu Taung village, Thandaunggyi Township. So people could not use cars and motorbikes to travel on that road. 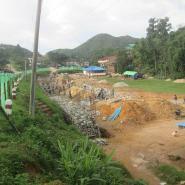 Also, the road was constructed in Taw Phya Gyi village, Thandaunggyi Township [and] it damaged local villagers’ lands. However, local villagers did not get any compensation. Besides, only half of the road was finished and people could not travel by car on that road because the road is very steep. 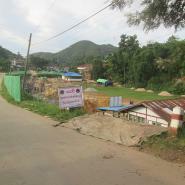 The Burma/Myanmar government’s army camps in Thandaunggyi Township, Toungoo District are not like before. They [Tatmadaw] have rebuilt the fence of their army camps to be stronger and stronger. They also clean the area around their army camps. They rotate their army troops every two or three months. They do not only transport rations regularly, they also transport ammunition to their army camps. On May 5th 2016 Tatmadaw from Southern Command Headquarters transported rations by military trucks to Tatmadaw army camps in Thandaunggyi Township and the temporary camps at the frontline [in the east of Thandaunggyi Township]. When they came across Thandaunggyi Township, they accidently [collided with and] crushed one motorbike and two villagers died straightaway. Then, they [Tatmadaw] drove away. Later on, the other villagers found out that Tatmadaw truck crushed the villagers’ motorbike [and killed the two villagers]. Tatmadaw first tried to argue that they did not crush the motorbike but villagers found the evidence that there was blood and a piece of motorbike material on the wheel of the Tatmadaw truck. The truck driver, Ko Ye, ran away at night but he came back to face arrest the same night. Tatmadaw soldiers took him [Ko Ye] to the military court but villagers still do not know how he was punished and what punishment was given to him. Tatmadaw did not give any compensation to [the families of] two villagers who were killed and they also did not inform the relatives of those two villagers [about the incident]. 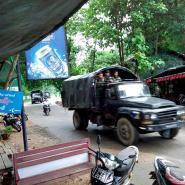 There was a military training in Bu Yin Naung camp Town. Every four months military training was given to Tatmadaw soldiers. On August 8th 2016 Major General Aung Myo Thant, Military Operations Commander, from Military Operations Command (20) travelled from Baw K’lee Town to Maung Nwe Gyi army camp in Thandaunggyi Township, Toungoo District. He secretly came to check on the Tatmadaw soldiers and [check on] the army camp at the frontline. However, local villagers heard the news that he came to check Tatmadaw soldiers. [After local villagers heard this news,] Tatmadaw informed local villagers that a Tatmadaw medical unit was coming to help villagers [when really it was Major General Aung Myo Thant traveling to conduct the check]. However, no-one from Tatmadaw’s medical unit came to give medical treatment to local villagers. It was obvious that Tatmadaw lied to local villagers [about the purpose of the Tatmadaw transport] in order to be able do their activities. It showed that Tatmadaw did not trust local villagers. On July 25th 2016 commander-in-chief of the armed forces, Senior General Min Aung Hlaing went to Bu Yin Naung camp Town in Thandaunggyi Township. Then, he called some leaders to discuss about military activities. He also went to check on Tatmadaw’s tea plantation factory in Thandaunggyi Township. He travelled by helicopter. The road was full of soldiers in Thandaunggyi Township for his security. After his trip, Tatmadaw army troops rotated their army camps at the frontline in the east of Thandaunggyi Township. On August 10th 2016 Ya Ka Tha [Warrant Officer and Sergeant Training Activity] from Bu Yin Naung camp Town went to check on lands that they had confiscated in Thandaunggyi Township together along with Land Measurement Department and responsible people from Thandaunggyi Township. However, Ya Ka Tha has not yet returned the confiscated lands to local villagers. 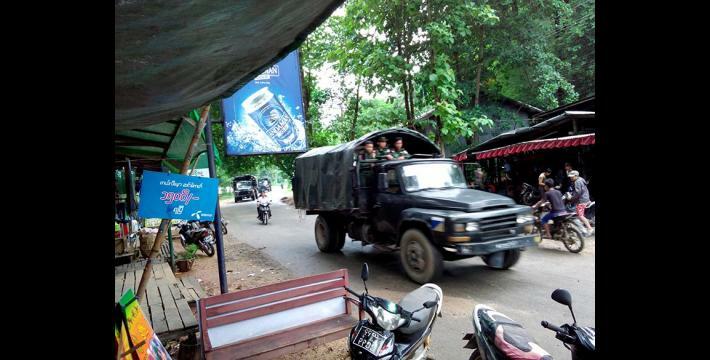 On August 11th 2016, 17 military trucks which were full of Tatmadaw soldiers from Toungoo were sent to the army camps in the east of Thandaunggyi Township. They also transported military weapons to the army camps in the east of Toungoo. It concerned local villagers as [they saw the transportation of military weapons] a threat. On August 11th 2016 Tatmadaw soldiers from Bu Yin Naung camp Town, Thandaunggyi Township set up signposts on villagers’ land in A--- village, B--- village and C--- village in Thanduanggyi Township. According to the signposts those lands, which have been confiscated by Tatmadaw, are now Tatmadaw’s target practice area so no local villagers should trespass on them. The villagers who lost their lands now face many concerns and many problems. KNU tried to eliminate drugs in their controlled-area. On June 30th 2016 KNU arrested drug dealers and confiscated drugs. The value of the drugs that they confiscated is 400,000,000 kyat [US $296,552.00]. Then, KNU and local villagers destroyed all of drugs that they confiscated. On July 20th 2016 KNU arrested drug dealers again in Thout Yay Ket village, Leik Tho Town, Thandaunggyi Township, Toungoo District. Currently, KNU is trying to explain to local villagers who do not know clearly about their rules and policies in the area under their [KNU] control in order to rebuild community. KNU also try to talk with villagers in order to help them to get back villagers’ lands which were confiscated. Regarding education in Thandaunggyi Township, Toungoo District, the Education Department of the Burma/Myanmar government need to make sure that Burma/Myanmar government’s teachers should follow the rules and policies. Regarding villagers’ livelihoods, the Burma/Myanmar government needs to control the commodity price in order to help villagers to support [the cost of] their livelihoods. Tatmadaw and local villagers are not in the same boat [in agreement]. The local villagers could not trust Tatmadaw. To be able to trust Tatmadaw, Tatmadaw should try their best for villagers. In conclusion, the Burma/Myanmar government needs to observe the situation of local villagers in order to fulfil their needs. All conversion estimates for the kyat in this report are based on the February 1st 2017 official market rate of 1349 kyat to US $1. The 2008 Myanmar Constitution mandates that the Union of Myanmar implement a free and compulsory education system for all. For a detailed assessment of the barriers for children, particularly females in rural areas, to receive education see, Chapter IV: Health and Education, “Hidden Strengths, Hidden Struggles: Women’s testimonies from southeast Myanmar,” 2016. Kaung Myanmar Aung Company (KMAC) or Kaung Myanmar Aung Group of Companies is a Myanmar-owned business group with investments in teak plantations in Toungoo District, and mining, agriculture, shipping, construction and real estate development within Myanmar. Their chairman is Mr Khin Maung Aye. KMAC have been implicated in land confiscation cases in southeast Burma/Myanmar which have included threats to villagers who were customary owners of the lands, see “Toungoo Situation Update: Thandaunggyi and Htantabin townships, November 2014 to February 2015,” July 2015. Affected villagers held protests against the company in 2015 and early 2016 in order to demand the return of their lands, see “Toungoo Situation Update: Thandaunggyi and Htantabin townships, November 2015 to January 2016,” July 2016. For information on a similar case with KMAC in Pyin Oo Lwin Township, Mandalay Division, see “Presidential adviser sues 13 farmers for trespassing,” Myanmar Times, September 2nd, 2013. For more information on this case, see, “Toungoo Situation Update: Thandaunggyi Township, November 2015 to February 2016,” (published November 2016). Zaykabar (Zay Kabar) Company is one of the largest construction companies in Myanmar. The chairman of Zaykabar Company, Dr Khin Shwe, is also a member of the Amyottha Hluttaw, the upper house of the Myanmar parliament. The company was listed on the Burma Sanctions list by the United States government due to its close ties to the former military government, until the list was terminated in October 2016, see “Issuance of Executive Order Terminating Burma-related Sanctions Program; Burma-related Designations Removals,” October 2016, U.S. Department of the Treasury. Zaykabar Company construction and development projects have caused land confiscation and livelihood impacts, see for example “Land confiscations in Kyaikmayaw Township, Mon State,” August 2013, Human Rights Foundation of Monland. For more information on this case, see “News Bulletin: Thandaunggyi Township, May 2016,” published September 2016.